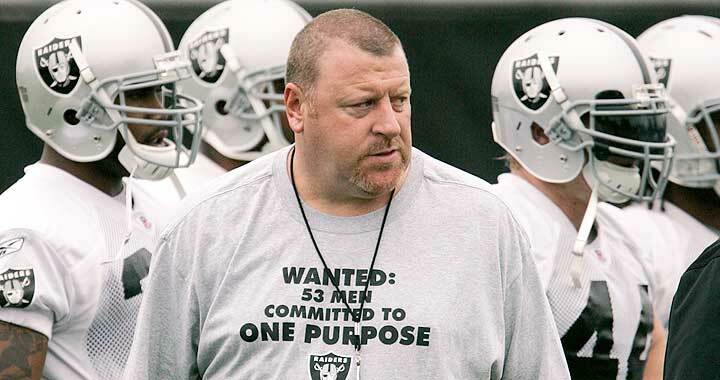 Published: Aug. 9, 2009 at 01:13 p.m.
Tom Cable has brought an unorthodox approach to Raiders training camp. OAKLAND, Calif. -- The task before Tom Cable is magnanimous as he attempts to transform a franchise that has fallen on hard times since Super Bowl XXXVII in 2003. The Raiders have endured six straight seasons with 11 or more losses, and their 31-68 record during that period ranks as the league's second-worst mark. With success eluding the team at seemingly every turn, Cable has gone back to basics to reverse the fortunes of franchise. Every new coach preaches of a return to the fundamentals, but Cable has taken it a step further in his first training camp as the head coach by using a "learning intensive approach." The 44-year-old head coach conducted four days of walkthrough-like practices designed to teach his players how to properly execute their assignments. By eschewing contact or competitiveness during the first days of camp, Cable is teaching his team to win by focusing on the details that are often overlooked when the intensity of camp revs up. While Cable's unorthodox method is sensible in many ways, it hasn't stopped legions of team observers from criticizing the new head coach's attempt to revive the dormant franchise. However, those cynics may soon eat their words as the Raiders have been noticeably shaper in the execution of their offensive and defensive schemes during the early part of camp. Moreover, the team's confidence is brimming after riding the momentum of a two-game winning streak to close the season. The downtrodden Raiders have gone through four head coaches and numerous quick-fix plans since their last shot at glory, but Tom Cable's back-to-basics approach may finally lift the dark cloud that has been hovering over the franchise. » JaMarcus Russell, the Raiders' much-maligned franchise quarterback, enters the season squarely in the crosshairs after reports surfaced questioning his work ethic and leadership skills. However, the endless speculation hasn't appeared to rattle the third-year pro's confidence as he looked poised leading the team during drills. Russell's stellar arm strength is apparent on his deep throws and he has shown better touch on his intermediate tosses. While he still appears hesitant at times in the pocket, Russell's grasp of the offense has clearly improved as he looks more comfortable hitting the second and third options in his progressions. With former Pro Bowler Jeff Garcia lobbying for a shot at the starting job, Russell's on-field improvement comes at just the right time. » The Raiders could field the league's top rushing attack in 2009. The terrific trio of Darren McFadden, Justin Fargas and Michael Bush gives the team the versatility to attack defenses with a varied attack on the ground. McFadden acts as the team's home-run hitter, and is most effective on perimeter runs designed to take advantage of his exceptional speed and quickness. Fargas gives the team a hard-nosed inside runner with sneaky power and explosiveness. Though he doesn't get the acclaim of his peers, he could emerge as a 1,000-yard rusher in the team's power-based scheme. In Bush, the team has a dynamic runner with the skills to thrive as an inside or outside runner. The third-year pro flashed his immense talent during the season finale against the Tampa Bay Buccaneers (27 carries for 177 yards with two touchdowns), and he continues to impress with his work at camp. With new fullback Lorenzo Neal specializing in opening huge holes, the pieces are in place for the Raiders to excel as a smash-mouth rushing attack. » John Marshall's version on the Raiders' defense is sure to look vastly different than the unit directed by Rob Ryan. Whereas Ryan attempted to defend opponents using a conventional defense that plays extensive man-to-man with selective blitzes, Marshall is promising to rev up the team's pressure package this season. In his previous stint as the Seattle Seahawks' defensive coordinator, the 30-year NFL coaching veteran's high pressure scheme resulted in a league-leading 50 sacks in 2005 while also allowing only one 100-yard rusher on the way to a Super Bowl appearance. In Oakland, he has the pieces available to replicate those accomplishments. With Nnamdi Asomugha capable of locking down one side of the field, Marshall is free to turn loose five or six rushers on the quarterback to disrupt the timing of the passing game. Veteran Greg Ellis joins emerging Trevor Scott to give the team a set of bookend pass rushers, and Thomas Howard's speed makes him a viable weapon as a rusher. Though the defense may need some time to adjust to Marshall's disciplined approach, the unit has the personnel to blossom in the scheme. As the top receiver selected in April's draft, Darrius Heyward-Bey will be under intense pressure to produce. Darrius Heyward-Bey heads into his rookie season under intense scrutiny from observers after being the first receiver taken in the draft. The former Maryland star has struggled holding onto the ball during the first week of camp, but has displayed the explosive speed and athleticism that made him an intriguing first-round prospect on many boards. While he may never live up to the expectation that comes along with being the top player selected at his position, he could eventually emerge as a big-play weapon in an offense that is designed to throw the ball down the field. 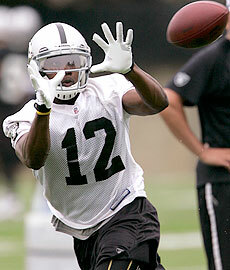 The Raiders have a budding star receiver in Chaz Schilens. The second-year pro from San Diego State started six games for the team a season ago, and recorded 15 receptions for 226 yards (15.1 avg.). While those numbers aren't eye-popping, his outstanding size (6-foot-4, 225 pounds) and explosive athleticism makes him a difficult matchup on the outside. With the Raiders' potent rushing attack dictating eight-man fronts with one-on-one on the outside, Schilens could easily post big numbers as the team's No. 1 receiver. The memorable image from the day is watching the Raiders taking the field as part of the team's annual Raider Nation celebration at Oakland-Alameda County Stadium. In spite of the team's abysmal record over the past six seasons, the rabid Raiders fans remain staunchly behind their team and the Black Hole is buzzing about the team's prospects in 2009. » Zach Miller is poised to have a big year as the team's top option in the passing game. The third-year pro led the Raiders in receptions a season ago, and is set to duplicate the feat as the designated playmaker in their aerial attack. As a precise route runner with outstanding hands, Miller terrorizes opponents over the middle of the field. With the team sure to incorporate more play-action passes to complement the running game, he should continue to sport a robust yards-per-catch average. » In Kirk Morrison and Thomas Howard, the team has a pair of Pro Bowl-caliber linebackers set to anchor a rejuvenated defense. Morrison, who perennially ranks as one of the league's leading tacklers, acts as the brains of the defense from his middle linebacker spot while Howard fills in as the designated playmaker from the weak side. Collectively, they wreak havoc on opponents when allowed to roam freely on the second level. With Marshall set to unleash a high pressure scheme in 2009, Morrison and Howard could emerge as household names by season's end. » Don't be surprised if the Raiders' dynamic return game leads to a couple of wins in 2009. Returners Johnnie Lee Higgins and Justin Miller combined for five return touchdowns last season, and could help the team win the coveted field position battle by producing a few game-changing plays in the kicking game. Given the likelihood of the Raiders playing in a lot of close games behind their rushing attack, the ability to score points on special teams could be the deciding factor in those contests.